Over the years, as Hollywood has aged and creativity has faded, there has been a spate of remakes of old movies. There is an innate danger in any remake, the obvious comparison to the original. By and large, very few remakes have been touted as major successes. The first remake that always pops into my head is King Kong, which has been remade several times. The original, starring Faye Wray, is a classic which has transcended time. The creative cinematography, featuring black and white, gave it a uniqueness. Even Fay Wray’s continually screaming throughout the movie somehow seemed special. The finale at the Empire State Building would certainly seem campy by today’s standards, but resonates with its amazingly strong impact on the audience as Kong plummets to the ground. Since then, there have been remakes of many horror & sci-fi movies; e.g. Psycho; Nightmare on Elm Street; Texas Chain Saw Massacre; Invasion of the Body Snatchers, The Thing; Carrie; Planet of the Apes. There have been a numerous comedies, many of them Disney classics: The Shaggy Dog; The Love Bug; The Parent Trap. In my humble opinion, the original versions remain the more memorable in almost every case. Finally, there are the DC classics: Superman and Batman; and the Marvel classics: Spiderman specifically. Although I am a huge fan of the Jack Nicholson – Michael Keaton original “Batman”, Christian Bale as the Dark Knight was no slouch, particularly in “The Dark Knight Rises”. My daughter and I attended the latest Marvel rebirth: “The Fantastic Four”. I asked my daughter for a rating on the movie as we left the theater and she gave it a 5.12 out of 10. That would come to about two stars by Siskel & Ebert, if Ebert was still alive. He may be the luckier film critic in this case. Personally, I am extremely tolerant of what I deem “literary license” or, more specifically, the rewriting of the history of a superhero, or, in this case, superheroes. However, one looks for genuine creativity and it is sorely lacking in this film. The onset of the film is fine with the majority of the main characters meeting as children in a school for geniuses. However, “reinventing” Sue and Johnny Storm as geniuses may have been pushing the envelope. The original Fantastic Four injected comedy throughout the movie, with Ben Grimm and Johnny Storm trading quips on a regular basis. Even Doom had sarcastic, semi-comical lines periodically. 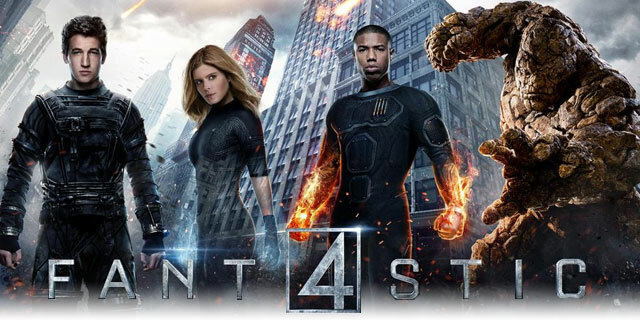 In the 2015 version of the Fantastic Four, the film is devoid of humor. The feeble attempt by the Director, Josh Trank, to inject a sense of total reality into the movie fails miserably. The characters come off as stoic, lifeless, and conceptually “boring”. As for the casting of this movie, it would be virtually impossible not to criticize Josh Trank’s selections. In “Chronicle”, Trank put together a stellar case of unknowns. For the revised “Fantastic Four”, Trank’s selections may have been influenced by recent successes of some the actors; e.g. Kate Mara in “House of Cards” and Miles Teller from “Divergent” and “Insurgent”. (Note: As a big fan of the Divergent series, I found it a bit difficult to reconcile Miles Teller’s emergence as a hero in this movie from being an “antihero” in that series.) Trank brings back Michael B. Jordan from “Chronicle” and Jordan’s feeble attempts at being an arrogant, unhappy son fall totally flat. Miles Teller brings nothing special to the role of Reed Richards and Jamie Bell as Ben Grimm is an unmitigated disaster. Whereas Michael Chiklis was an established personality on TV, Jamie Bell is a relative unknown, physically too small for the part, and shows little or no emotion in the film. Upon becoming “the Thing”, his acting improves, primarily because we can no longer see his face. Julian McMahon, a mixture of good and evil on the TV series “Charmed,” brought a certain panache to the role of Doom in the 2005 film, while Toby Kebbell turns Doom into the epitome of evil, but without any personality. Kate Mara is the only superhero cast member that actually was tolerable. Although a bit overage at 32 for a teenage role, she is a very cute, petite actress who actually injects some mild comedy into her role. It is difficult to compare her to Jessica Alba, as they are so entirely different physically and stylistically, but Kate Mara was an adequate replacement. With the ages of all the primary cast members, in reality, being 28 to 32 years of age, one never gets the feel that any of them are really teenagers. Only Miles Teller is able to assume that characterization with any effectiveness at all. The major battle scene with Dr. Doom in Fantastic Four 2005 is fun, exciting, and heroic with classic Marvel dialogue. In the new version, the battle scene is empty, boring, and the dialogue puts one to sleep. In the 2015 version, the comic book romance between Sue Storm and Reed Richards is never developed, leaving a major hole in the movie. There is a hint that it will blossom in the sequel, if, God help us, there is a sequel. Finally, the ending leaves one cold. The 2005 version is comedic, romantic, and leaves you wanting more. The 2015 version is amateurish. Sorry, spoiler alert, but it is how the team gets its name, and it could not be more lame. It must be noted that Josh Trank apparently tweeted prior to release of the movie “that he had made a “fantastic” version of the film that the audience would “probably never see”. This was an apparent barb thrown at the 20th Century executives who he blamed for interfering with “his” project. The truth is that there is no way on this planet or the planet Zenn-La that anything could have saved this film, more or less made it “fantastic. Bombs Away!! Trank in the tank. Do yourself a favor. Stay home and watch the original!